Aaron Gibson presents an interesting blend of singer/songwriter and solo bassist. 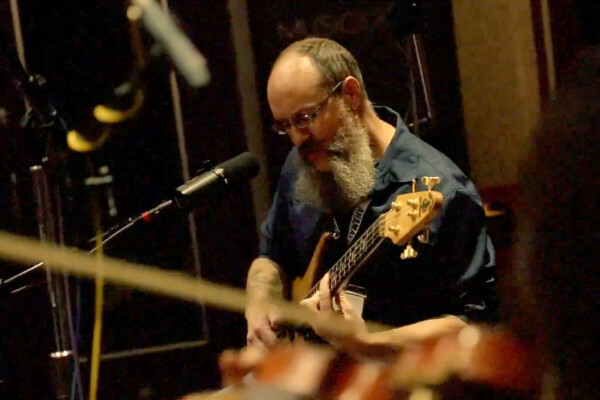 Once described as “Jack Johnson playing with the Red Hot Chili Peppers,” the Oregon-based low-ender comps for himself while playing impressive original tunes as well as covers. 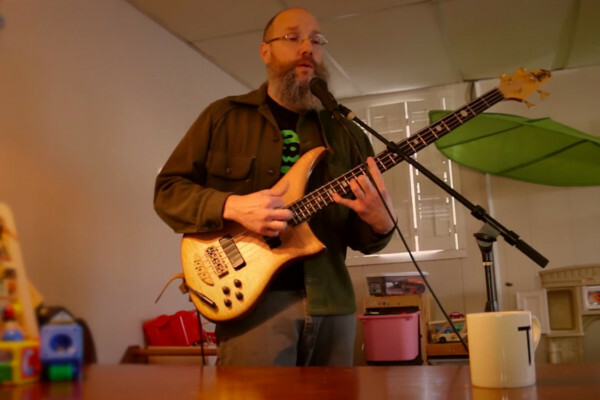 Aaron scores solo gigs by covering the bass line, harmony, melody, and vocals all on his own. We reached out to find out more about how his style came about, his gear and what’s next for him. I had not previously thought of myself as “old school” or “new school”, I just try to play my songs. My playing style, or approach, evolved while trying to find a way to write songs and play gigs without a band. I was increasingly frustrated with the time and emotional energy invested in bands that would fall apart before getting anywhere. I really loved my bands, but I didn’t want to stop playing every time there was a hiccup. So, the goal was to make something sound complete enough that I could walk into the local coffee house or watering hole with my old four string and entertain the crowd without a bunch of set-up or fuss. Some great bassists are out there doing it with looping, and effects and stuff, but I just don’t have the money for that gear right now. The musical style is a result of my whole life as a music fan. I love everything from the Flecktones to Demon Hunter, Mingus, Emmylou Harris, Dylan, The Dead Milkmen, Rich Mullins, The Beastie Boys, Charlie Parker, Stevie Wonder, The Dead, Zeppelin, Matisyahu, Fugees and on and on. I think that my influences and love of music in general have created my style. I have even been accused of sounding like Jack Johnson playing with the Red Hot Chili Peppers. I have an anniversary series Alembic bass and a Mesa Boogie Walkabout Scout. Well, I have been opening for some bands around the North West and playing in some art shows, I am playing at a Nike barbecue this week. Truth is that I usually only get to play for people who have already seen me play, kind of like having the superpower of being invisible only when absolutely no one is looking. Club bookers don’t call back when they find out it is just solo bass. That is one reason for the YouTube videos, they need to be convinced that it works (and I have seen an increase in gig ops since people started watching them). No. I have often felt like I have one of Robert Louis Stevenson’s “Black Spot” marks or something. 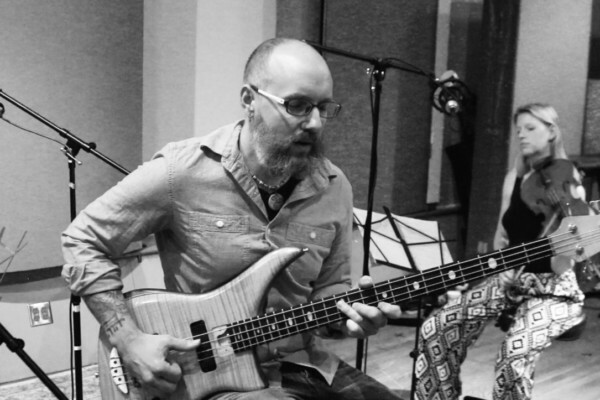 I’ve tried getting a few gigs as a traditional bassist, but too many people have predefined clear ideas of what they think the bass should do, I don’t fit into that mold very well. I have always preferred “contrast and compliment” in music, but I do enjoy playing along with like minded musicians. Oh, and there just aren’t too many musicians in the forest were I live. You can check out the videos, and my new album will be out August 17th. If you want to hear it now, just email me through my website or find me on Facebook, ask for the link and I would be happy to send you a pre-release copy (you’ll still have to wait for the art work and liner notes though) and I would actually love the feedback. My website and my Facebook page. Becoming Unravelled, my new album, drops on August 17th and will be free to all (for six months or so). I hope to get some interest and more gigs out of it, maybe put a band together to play the album tracks. I have enough songs together to start another record, so recording is in the cards too. Eventually I want to make a living from my music and that is finally starting to happen. I’ve made about fifty bucks so far and, with hard work and diligence, I am confident that I will be able to double or even triple that figure in the future! I find Aaron to be an amazing bassist. Personally, I also love writing solo stuff, and this is very inspiring to say the least. Surely a big influence for now on in my music making process. Having been Honored to previewed The New Album “Becoming Unravelled” I can tell you it will be Well Worth getting a copy any way you can. Aaron Gibson is a Welcome Addition to my Library. Great bassist. Love the song. Just met Aaron a few nights ago at a festival set I played. Great player and a great guy! so stoked to see this. Aaron is a huge influence on me personally and after following his music for about 2 years it is good to see his music reaching others and grabbing them like it has grabbed me. I have had the same problems with bands and this ability to make it work regardless is inspirational. Cool stuff! Nice T-shirt on “Lost in Forever”. I really dig his voice. I’m assuming I don’t have to say anything about his bass playing. Thanks “No Treble” to show us so different points of view for nice living! Amazing album art work and beautiful songs! Pretty different.